Spend an exciting few hours exploring the Black Canyon National Water Trail on this fully narrated and historic tour of the Colorado River. Your journey begins with pick-up from your hotel and a ride to the check-in point overlooking Lake Mead. From there you will travel down Lower Portal Road, the same road used by construction workers when building the Hoover Dam. From the base of Hoover Dam you'll have a bird’s-eye view of the Mike O'Callaghan–Pat Tillman Memorial Bridge spanning Black Canyon and connecting Arizona and Nevada, 900 feet above the Colorado River. During your 12-mile exploration of history, you will pass through canyon walls that in some places rise 2,000 feet above the river’s edge. 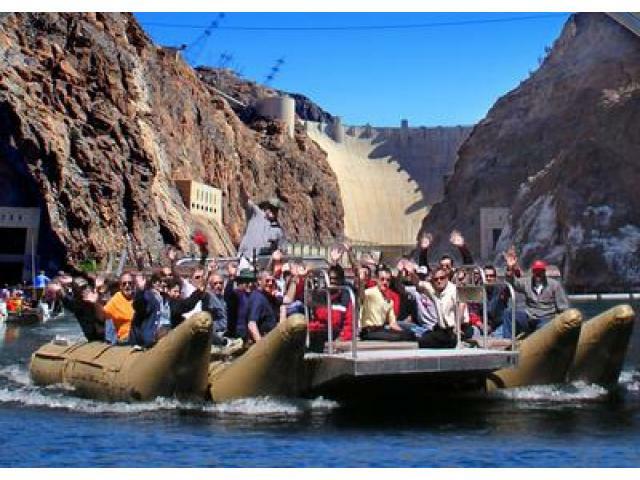 Experience waterfalls, hot springs, geological wonders and wildlife such as desert big horn sheep, osprey, great blue heron and more with the help of an experienced guide with incredible knowledge of the history of the dam and area. A stop along the way at a beach for lunch will give you the opportunity to swim or play in the cool clear water of the Colorado River. Lunch, including a turkey wrap, chips, apple and bottle of water will be served in a souvenir insulated bag. Vegetarian and gluten-free lunches are also available with 72 hour notice. The raft tour ends at Willow Beach, Ariz., and then you will be transported back to your hotel.